The software of the fork-o-drumbot is simple, but it uses a number of tricks that I would like to show you here. the software recognizes the note and sends a PWM signal to the related solenoid, proportional to the intensity of the note. Seems easy, doesn’t it? But often simple things hide something complex. Let’s go in depth! In the last few days I had the privilege to participate at the amazing Science Hack Day Berlin! It was the first time for me. I just went there and listened to the speeches of some people who wanted to invent something more or less related to science. It was full of talented and crazy people! A very nice atmosphere and an unforgettable event, thanks to the beautiful staff ! The rules were: you have less than 48h time to build/hack something related to science. I didn’t know those rules. I arrived late and I heard Peter Westerhoff‘s pitch (never met before). He needed someone to help him with the electronic part of his idea: the Super Short Distance Vehicle. Do you really know what kind of transportation do you need if you daily commute to your job by public transport? No, you don’t! You need something that’s fast, light, with maximum 10-15 km of range. You need the SSDV! (If you are not sure about this, you can ask Peter, he will surely convince you). We were sleeping on our bed when this suddenly happened. Rude awakening in the middle of the night. This is something I am really proud of. Enjoy! I think that the funniest and most creative part of all this project was building the mechanics. I mean, I could have bought specific components. For a project like mine, if I really needed to buy every single screw, my budget would have exploded. I have started walking around the flat knocking on everything to hear how it sounded, and I finally run into a wooden box. This box gave me the inspiration of building something like a cajon. Federica, Vito, and the Fork-o-Drumbot live!!! The trembling voice of Federica and the trembling fingers of Vito in front of the oceanic crowd!!! Thousands of thanks to PollyAndBob for their idea, the great opportunity and the perfect organization! Many thanks also to the lovely Susann who made this video, fed us with delicious cake and tea, and hosted us on her balcony. By the way, Fork-o-Drumbot seemed not to be scared about people! Thanks to DarioJ Laganà for the picture. Check out his beautiful photo reportage about the magic atmosphere! 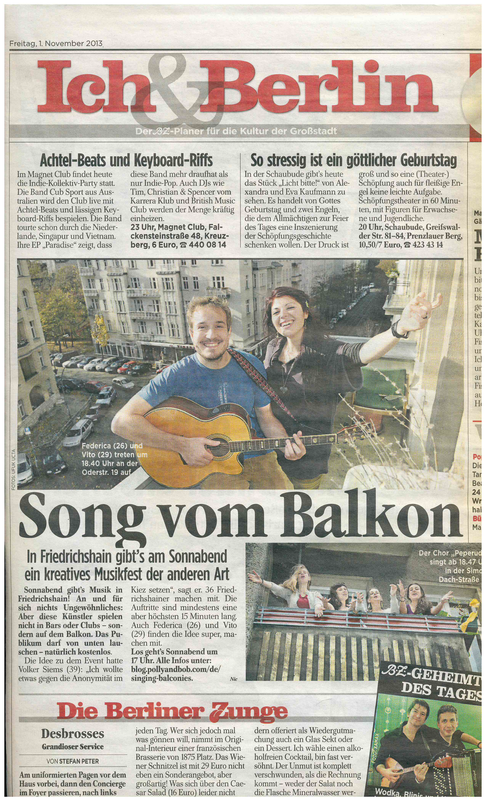 Ready for the “Singing Balconies of Friedrichshain” ? check out my last article about it here!